Tower 3, 6th Floor!! New Master Spa Shower!! Free Beach Service Included!! The warm Florida sun and cool ocean breezes await you at this beautiful sixth floor, tower three condo at Long Beach Resort! 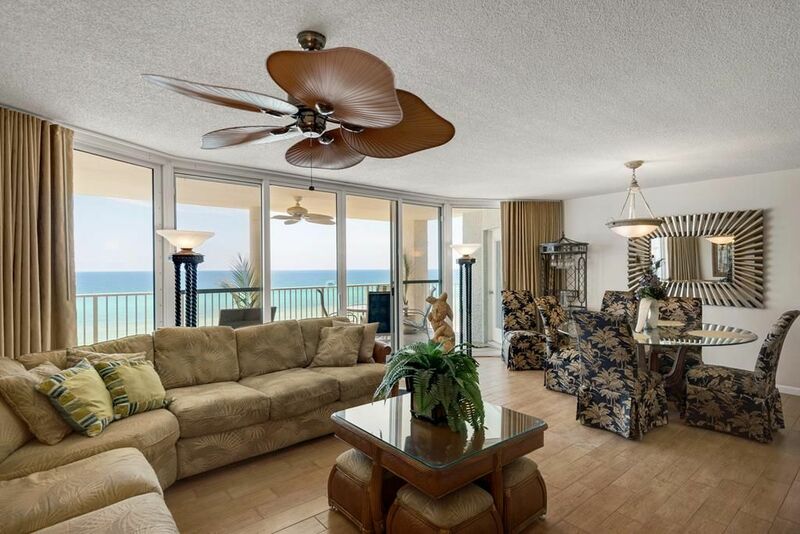 This unit features upscale furnishings and amazing, wall to wall, floor to ceiling oceanfront views from every room of this 1400 square foot paradise. The living room has a huge, sectional sofa offering plenty of comfortable seating to watch the new 37" flat screen TV/DVD. In the master bedroom, there is a king size bed and in the second bedroom, two queen size beds. There is a TV and chaise lounge in each bedroom to relax and watch the beach. Each bedroom also has its own private, full size bath, the master bath features a beautiful new walk in tiled shower spa and the guest bath features a large marble garden tub and marble vanities with his/hers sinks. The living room/dining area and both bedrooms all open up onto a huge, private balcony overlooking 1300 ft of sugar white beach. Enjoy the large lagoon pool (6800 square ft) with tropical islands and waterfalls (located between towers 2 & 3), two polynesian pools (seasonally heated), three hot tubs, poolside bar & grill (seasonal), on site jet ski/umbrella chair rentals, gated access and 24 hour security with plenty of parking. We are near all the great restaurants, shopping, amusements parks, golf courses and if you forget anything, don't worry, Super Wal Mart is right across the street! Highly recommend and would most definitely return! Views from condo were amazing and beach was fantastic and significantly less crowded than all neighboring resorts/ condos. Everyone is extrememy friendly & helpful. There was only one (if you can even call it a negative because it was fully disclosed). You can not get into your condo until EXACTLY 4:00 without paying $50/hour extra. We arrived at 3:20 and had to wait 40 minutes to get in. Just a downer... I was shocked that there would be additional charges to get in early... In 20+!years of vacationing I have never seen that anywhere we have gone. That was the biggest disappointment of the week. I would most definitely return and highly recommend this unit. Also suggest contacting Kim’s condo’s directly to save $$. We stay at Long Beach at least once a year and sometimes twice, this room was great. It had everything that you would want and need. The only thing was the mattress in the master bedroom was not the best, but we made due and had a great vacation. I would stay there again and again and again. We had a fabulous vacation staying in this condo. The pictures definitely do it justice. The condo was well maintained and we loved the beautiful floors, granite in the kitchen and the huge master shower! Views from both bedrooms and the living room are heavenly! Long Beach is a fantastic place to stay because it is convenient to everything. The weather and water could not have been better! We would definitely come back here again in the future. The condo was great! Nicely decorated, clean and all the comforts of home. This is our 5th year at Long Beach. Love the 2 master bedrooms, lagoon pool, hot tub, large balcony, fast elevators, security, etc. 2ND STAY HERE IN 11 MONTHS...ABSOLUTELEY OUR FAVORITE!! My family of 6 just arrived home on 5/20/2017 from another GRAND week vacation in this unit. We stayed here last June and loved it even more this go around. This is our first time renting same unit twice and I can tell you we are already planning our 3rd for October. Very clean and unit has everything you need. Loved a few upgrades from last stay like new lounge chairs on the balcony (which I slept very comfortably in a couple nights till my wife came and made me come in). Also some new décor. Just overall a great experience from location to amenities. Weather was AMAZING!! Would highly recommend this unit to anyone!! ADD 13.1% tax, $100 cleaning fee, $39 accidental damage insurance and $4 per car parking (2 cars max). Holidays and Special Events may have higher rates than what is posted.